There's a painting. You've all seen it. It's a beautiful landscape with huge arching trees and bright light… and a road… maybe I should call it a "Way." On the Way are three men walking. One of them, the one in the middle, is obviously engaged in conversation. He has his arm raised in the air to animate and important point. The other two who are walking with him, are listening intently leaning ever so slightly toward the Traveler between them. The artist, a man named Robert Zend (1827-1909) has captured a pregnant moment. You can tell in the picture that something very important is happening. Maybe it's the majestic trees that frame the scene, or the bright light that seems to reach out of the background and envelop the Speaker. The painting is about this text for today. It's called The Way to Emmaus. I remember seeing the picture when I was very little. It was one of the many prints that hung in the basement of my Grandmother's church (Along with a print of Christ of St. John of the Cross). Every time I hear or read this text that picture pops into my mind. In my mind, that must be exactly as it looked that first Easter Sunday. (Never mind that the trees are grossly out of place for the road between Jerusalem and Emmaus). "He was so young. Why did he have to die?" "Why did he have to die like that?" "He was such a good person he didn't deserve to die." "After all the miracles he did why did those people want to kill him?" "Couldn't he have found a way to avoid the … cross?" "He deserved better than that." "We all thought he was Messiah, but how could it be that Messiah would die?" "The women said that angels told them that Jesus was alive." "That's just wishful thinking… foolish talk." "He's not alive. I saw his blood dripping on the ground. I saw pale death cross his face." "Why didn't God do something to stop it all?" "Dead is dead. But… why is his body gone from the tomb?" The problem that our brothers on the way have, the problem we share with them is that we are unable to believe. 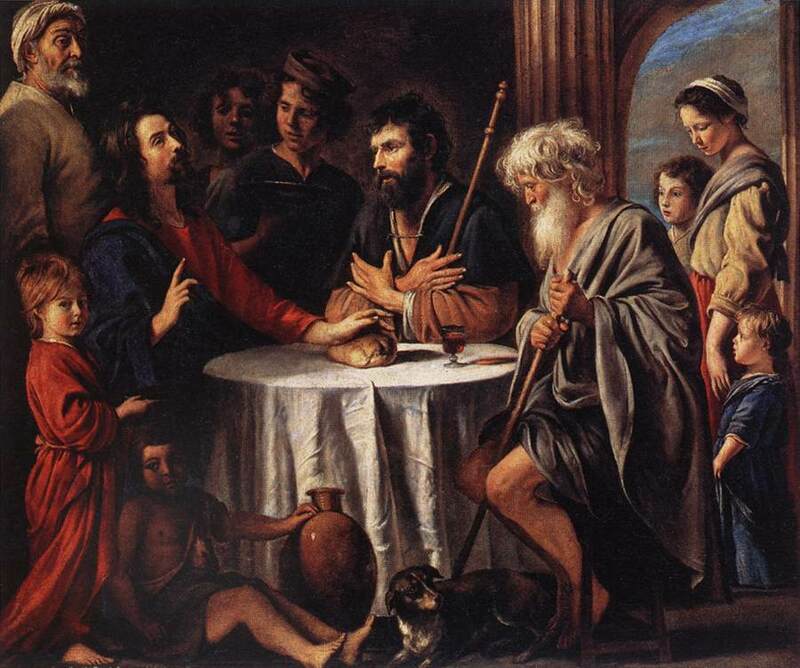 You see, the road to Emmaus is the road away from Jerusalem. Even though we have all the facts; the words and promises of Jesus before his death, the angels announcement, and the empty tomb. We can't believe. We can't make a faith appear in our hearts. We can't build a faith that is strong enough to believe that Jesus is raised from the dead. We can't choose to believe what can't possibly be true. We know the reality of death. We've carved too many names in stone monuments. We know that our names will be there all too soon. Any faith we would drag out of our own hearts, stands in the face of cold death. Any faith of our own making is full of doubt. Ah, but thanks be to God, he doesn't leave us to generate faith from our own sinful hearts. God gives us the faith we need to believe. And the faith that God gives is just that—the faith that God gives. It is faith to believe. It is faith that saves. That's what's just about to happen on the Way to Emmaus. Right there in the middle of our pain and sorrow and doubt, a Man, appears walking with us. We didn't really notice when he joined us but he doesn't carry the same painful expression we have. But he's walking the same way we are. He's come from Jerusalem, too. "What are you talking about?" (Luke 24:17) He asks. It's hard to believe that someone from Jerusalem wouldn't know what we've been talking about. It's hard to believe that someone from Jerusalem wouldn't feel the sorrow and pain over innocent death that was the center of so much of last few days. His question stops us dead in our tracks. And when the new Traveler answers, "What things?" it all spills out again; Jesus the great prophet of God, crucified, dead and buried, three days in the tomb; Jesus who we thought had to be Messiah, the one who would redeem us all, turned over to the Romans and death on the cross; Jesus' whose body is now missing, and claimed to be alive again by angels. We want to believe, but how can we possibly believe that Jesus is actually alive. The Traveler looks at each of us with a smile. "O foolish ones," He said, "and slow of heart to believe all that the prophets have spoken! Was it not necessary that the Christ should suffer these things and enter into his glory?" (Luke 24:25-26) And he gives us a gift. Well, actually two gifts, one gift to bring the other. From beginning to end, he tells us about Jesus using nothing but God's Word. He shows us Jesus in what Moses wrote, Adam, Eve, and the fall into sin. He shows us that Jesus is the one who God promised would crush Satan's head. (Gen 3:15) He shows us that Jesus is promised in the way that Moses lifted up a bronze serpent on a pole, so that any of God's people who looked at it would be saved from the poison bite of snakes in the desert. (Num. 21:4-9) He shows us how the prophets tell us that Jesus is the one who is born of a virgin (Isa 7:14), suffers under Pontius Pilate (Isa 50:6), is crucified (Isa 50:13-53:12), dead and buried, and raised again to life. On and on he goes, with each step we take down The Way to Emmaus. This Traveler tells us that every word written in the bible is really all about Jesus. He opens to us the real meaning of God's Word. And what's more, that Word about Jesus brings us faith in Jesus. That's the second gift that we receive as we walk along the way. As we hear God speaking to us about his promise of forgiveness of sins through Jesus, life, death and resurrection, our doubts disappear. It's as if our hearts are burning as we learn the truth about Jesus. And because the faith that we now have comes from God through his word we know it's faith that saves us. Faith that God gives is sure faith, it's not filled with the doubt of sin. "We want to hear more about the Messiah!" "It's too late to travel any farther, stay and eat, and talk." "We want to hear more about how Jesus is our Savior." Our hearts fill with joy when He agrees to stay. So we gather around the table to eat with Him. It's funny, that as we sit at table with this Traveler, our pain and sorrow and doubt are gone. Suddenly, the most amazing thing happens. As He takes the bread blesses it, breaks it and gives it to us to eat, we all realize that all this time along the way, we've been speaking to Jesus. And just as we see it's Him, He's gone. Jesus didn't leave us doubting. He didn't leave us to make our own faith from deep inside our hearts. He came to us on the Way to Emmaus. He came to us in His Word, and brought us the faith we need to believe. That is, in fact, what he does every time we gather to hear His Word. He didn't leave us alone to find the strength to live our lives in faith; He came to us in the breaking of the bread to give us the faith we need. That is, in fact, what he does every time we break bread together, and celebrate the special meal that He gave us. You and I don't have to generate the faith that God gives. There's nothing that we do deep in our hearts to make it grow either. Since it's a gift from God we can be sure of it, even when we have doubts. Jesus doesn't say to us, "Stay away from me until you believe in me." The risen Jesus who was crucified, dead buried, comes to us and gives us the faith to believe. So what do we do? We live in the faith that is given. Do you have doubts? Of course you do. So do I. Life is difficult and full of trouble. Talk to God anyway. Jesus says, pray these words, "Our Father who art in heaven…" Does the death threaten you with helplessness and despair? Of course it does. It does me, too. Gather with the rest of God's people where the Gospel, the Good News about Jesus, is told in its fullness and truth. Go where the bible is proclaimed as the story of God's love for sinful people, centered in Jesus Christ. Gather with other believing Christians, break the bread, and drink the cup that is Jesus very body and blood, there for you. Don't look to yourself to make your faith strong. Look to Jesus who comes to you and gives the gift of faith through His Word and Sacraments. Amen. "On the Way to Emmaus"
He was so young. Why did he have to die? Why did he have to die like that? He was such a good person he didn't deserve to die. After all the miracles he did why did those people want to kill him? Couldn't he have found a way to avoid the … cross? We all thought he was Messiah, but how could it be that Messiah would die? The women said that angels told them that Jesus was alive. That's just wishful thinking… foolish talk. He's not alive. I saw his blood dripping on the ground. I saw pale death cross his face. Why didn't God do something to stop it all? Dead is dead. But… why is his body gone from the tomb? … And it looks like he's going to continue traveling and not stay with us. We want to hear more about Messiah! It's too late to travel any farther, stay and eat, and talk. Tell us more about Jesus our Savior.